In a small part of the city of Fes an artisan wooden door welcome you to a great guest house the famous Dar Anebar. 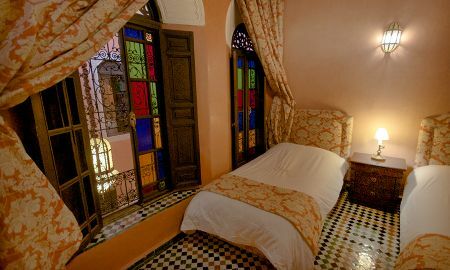 You will enter a beautiful historic Riad of charm with a patio of four facades and two floors; here the busy and noises streets are completely blurred. 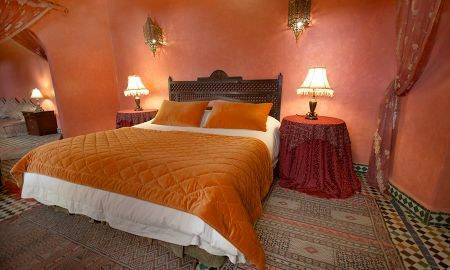 The riad offers you 4 suites, one guest room and 3 living rooms, which give on the patio, a fountain and a bartal. A panoramic terrace offers you a splendid view of the city of Fez. Totally renovated, into elegance and refinement, the Riad Dar Anebar warmly welcomes you reflecting the traditional lifestyle of Fez and Morocco. Dar Anebar is ideally located since it is near the famous Palais Jamai and close to the souks and the main monuments .